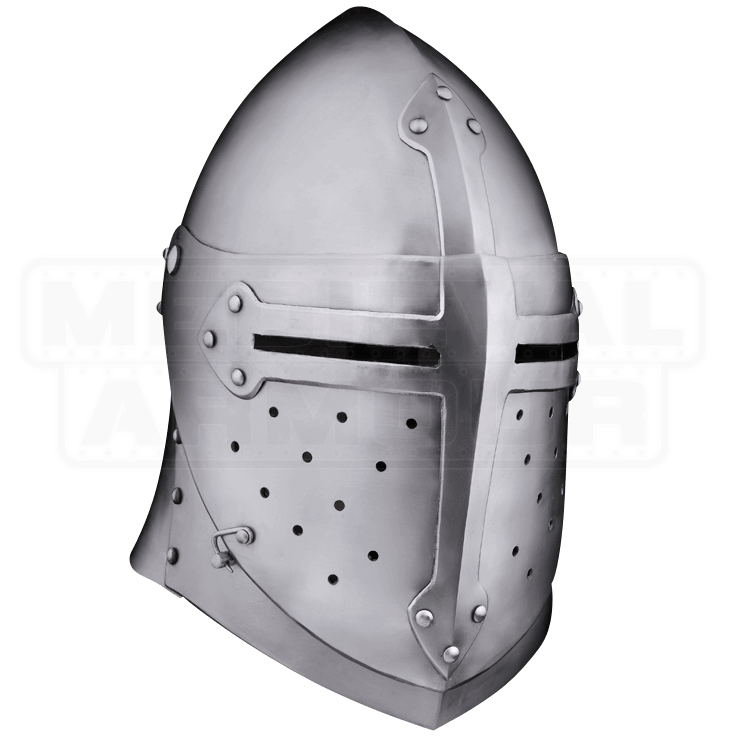 A variant of the medieval great helm, the sugar loaf helm possesses a more conical top than the original helmet design. The 14th Century Sugar Loaf Visored Helmet displays a subtle cross shape over the front of the face. The steel helmet has a leather chin strap. As is common in helmets of the style, thin slits serve as eye holes, and other small openings appear along the front. Great helms sacrificed ventilation and peripheral vision in favor of the vastly superior protection offered. This unique medieval helmet, though, finds the best of both worlds with a visor that lifts to expose the face. Small hooks keep the visor in place during battle. No set of medieval armour can be complete without the right headgear, so be sure to check out this fantastic Crusader helmet! Please note that steel thickness may vary slightly due to the handcrafted methods used in the manufacture of this item.